Reformers: George B. Wood and William Pepper, Jr.
Penn’s Medical School had a prosperous outlook entering the 1859 fall term, amidst regional competition and national conflict. The Medical School bested its rivals in Philadelphia by enrolling 528 students—its highest total in more than a decade. Despite increasing sectional tensions, almost half of the 1859 student body consisted of southern men. George B. Wood and Samuel Jackson advised the faculty, which included a couple of former students. Wood and Jackson, both approaching the end of their long careers, “retained some of the sparkle of youth” while teaching European advances in science and medicine. Younger professors like Joseph Leidy and Robert E. Rogers continued to build their reputation as teachers and scientists. But, the Medical School’s optimism quickly faded as North-South tensions overwhelmed Philadelphia in the winter of 1859. The departure of southern students from Philadelphia weakened Penn and its competitors. 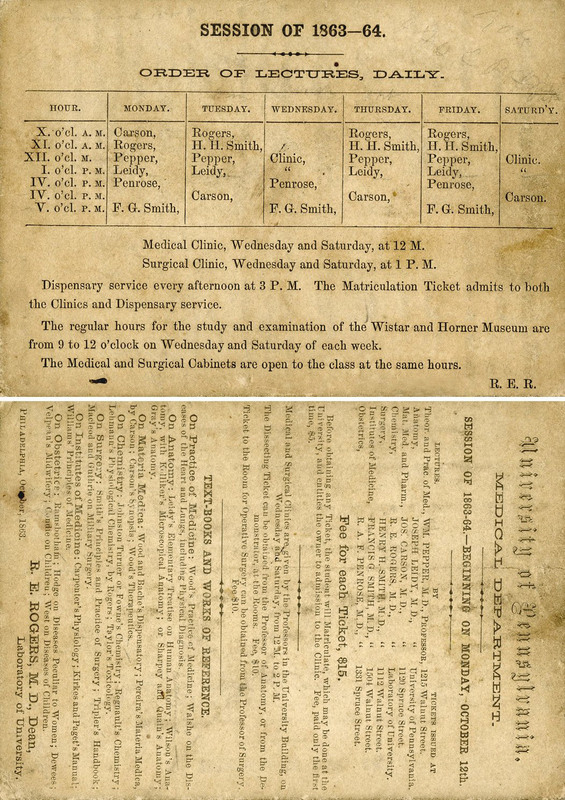 Medical students from below the Mason-Dixon Line formed the largest constituency of Southern sympathizers in Philadelphia. Governor Henry Wise of Virginia encouraged southern students to return to their home states. 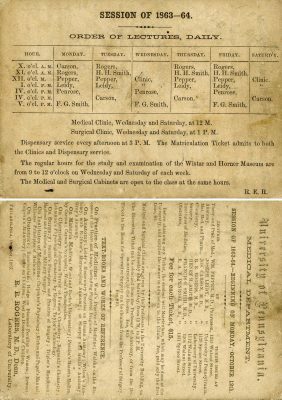 On December 21, 1859, 200 medical students from Jefferson College, Penn, and other schools quietly took trains from Philadelphia to Richmond. These students were greeted by faculty and students from the Medical College of Virginia and a crowd of citizens upon their arrival in Richmond. The migrant students continued their medical education at Richmond and other schools across the South. Both the Union and Confederate armies had faculty, graduates, and former students of Philadelphia’s medical schools within their ranks. Southern pride, rather than administrative mistakes or severe competition, caused the decline in Penn’s enrollment. The number of southern students in Penn’s Medical School dropped from 130 men in 1860 to 20 men in 1863. Penn and its rivals turned inward and recruited students from Pennsylvania, but they could not cover the loss. Young northern men were either enlisted in the Union Army or could not afford a year’s tuition. Without financial stability and with a small enrollment, Philadelphia’s proprietary medical schools fell apart. The Medical Department of Pennsylvania College closed in 1859 after their esteemed faculty resigned because of declining enrollment and unpaid taxes. Penn Medical University closed after its students and faculty left to serve in the Union Army. Financial stability, large enrollments, and national reputations kept Jefferson College and Penn’s Medical School afloat. Although it survived the Civil War, Penn’s Medical School had lost some of the prosperity and prestige it achieved in the antebellum period.